After we wrote about those wonderful Cwtches, I received a tweet on Twitter from one of our readers asking what boots we would recommend for boy toddlers. Everyone know that the choices for girls are literally endless when it comes to shoes and fashions, but what about the boys? Well, there are many fashionable boots for boys and we decided to dedicate a post to some of our favourites. The boots above are from Robeez. The model in the middle wears the classic Robeez Booties ($37.95) which are available in unisex, boys and girls colors. At the top right hand corner, we have the Mini Shoez Little Sheriff Booties ($33.95) with non-slip soles. Robeez has also introduced some ADORABLE 3D booties this season. We love the Moose ones ($37.95) pictured above, but they are also available in the grey Monster version. 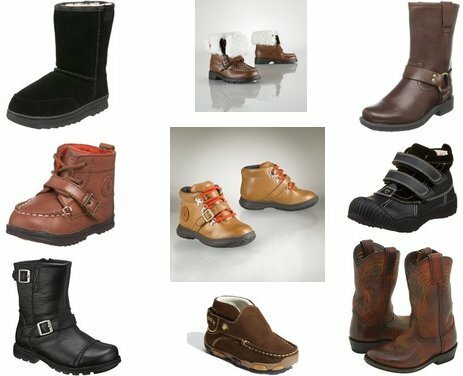 Ralph Lauren, Frye, Harley Davidson, Geox, Vincent and UGGs have some pretty cute styles as well! Click on each individual boot above for more information.